One thing that we’ve been missing during our months in Tasmania is proper swimming. Our girls love to play in the water and haven’t yet adjusted to the cooler water temperatures this far south. Today we spent the day at Launceston’s Aquatic Centre. I waited until the weekend so that the girls could play on a huge, inflatable obstacle course, but upon seeing it in person we decided it was too advanced for our (still) little girls. Before going into the centre, we suited and creamed up appropriately. Everyone wore hats and we carried our swim accessories. After entering the facility, we realised that this was unnecessary. 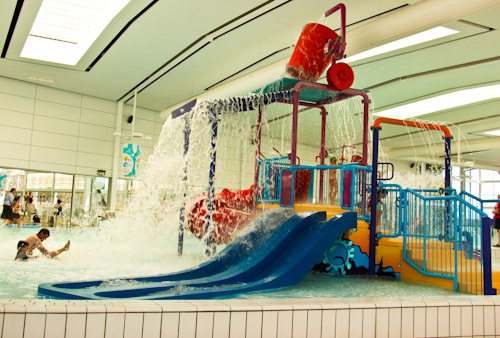 We spent most of our time playing in the indoor pools, where a variety of equipment and water depths meant that everyone was happy. The girls are thrilled to spend another whole day at the pool. The main water-play area has a huge, tipping bucket that periodically fills up and then spills over the playground. Today, Calista started swimming underwater. Aisha and Brioni received formal swimming lessons for a number of years when we lived in Brisbane, but Cali missed out on them because we started travelling. However, in simply exposing her to water again and again, allowing her to find her own comfortable levels, providing swim-aids when she asks for them and playing in the water with her, Calista has developed into an adequate swimmer. Early this summer, she inadvertently fell into a friend’s deep pool. Immediately, I was at her side, but I held back from interfering when I watched Cali turn around and find the edge to hold onto. Recently she started to move away from standing depths and flirt with deeper water for short periods of time. Today she swam underwater, between my legs again and again, occasionally becoming wedged as she fought her natural buoyancy. Delaney, too, is getting better at swimming. She has started to put her face into the water, and I’m keen to help her develop a natural paddling style. She still prefers to wear her float suit most of the time, but this gives her more confidence than actual buoyancy as she still doesn’t venture beyond standing depth. Calista and Delaney like to play together in the water. For a long time, Delaney towed Cali around on a pink bodyboard. Brioni kept her toy pony close and showed it all the tricks she could do. At this pool, Aisha didn’t play directly with other children but stayed in their vicinity and watched their games. 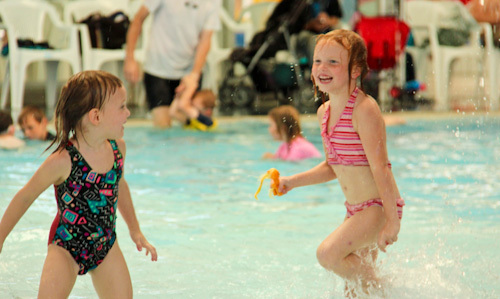 Swimming is a life-skill, and the girls love to spend a day at the pool. I’m thankful that Launceston has such a great facility that allows us to do this while also staying warm and out of the sun!